The licorice plant has been used for many centuries for flavoring and medicinal purposes. According to the website Medicinal Herb Info, the licorice plant was first discovered in Asia and is also known as Gan cao, sweet licorice and sweet wood. It is not cultivated worldwide. The plant's root may be dried out and made into a powder to be used in tablets, tea, liquid extracts and capsules. Before taking licorice for medicinal purposes, consult your physician so any concerns can be addressed. The licorice root found in licorice tea may be a beneficial weapon against liver diseases such as hepatitis, according to the Memorial Sloan-Kettering Cancer Center. The center also states that licorice extract containing glycyrrhizin has been used in Japanese clinical trials to effectively treat both hepatitis B and C. These trials have also shown that the reduction of liver disease can be attributed to glycyrrhizin. Traditionally, licorice has been used for the expectorant and demulcent properties that it provides, according to the University of Maryland Medical Center. Licorice tea helps to loosen and promote the expulsion of mucus while coating and soothing the sinuses and throat. 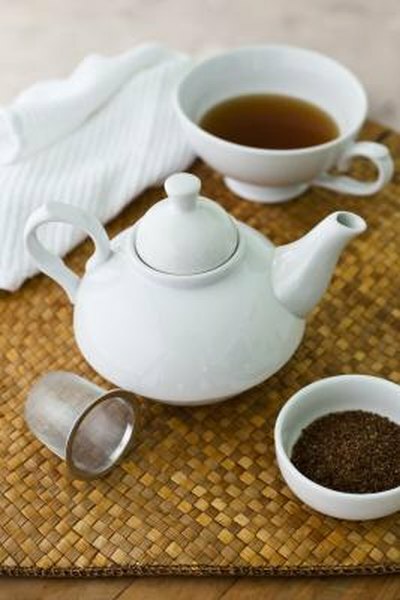 Consumption of hot tea confers additional therapeutic benefits via the steam, which helps sooth irritation in the respiratory system. Preliminary studies have found that patients who consumed licorice and items that contain licorice, such as licorice tea, experienced a decrease in body fat, according to Medline Plus. A study performed at Italy's University of Padua and published in the July 2003 edition of the "Journal of Endocrinological Investigation" took 15 patients of normal height and weight and evaluated the effects licorice on their bodies. Each patient was given 3.5 g of commercial licorice preparation on a daily basis over the course of two months. The study showed that while their overall body mass indexes remained unchanged, patients displayed a decrease in body fat mass.